In Episode #1 of the November 2016 series, we took a look at the prices of all 35mm Full Frame Digital Cameras. 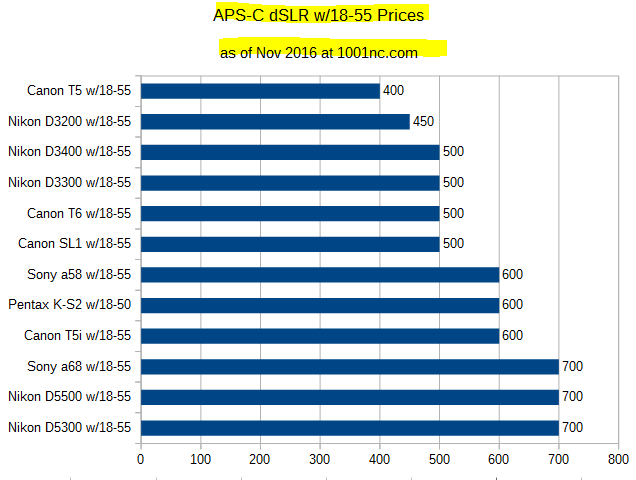 In this post, we take a look at prices of APS-C DSLRs only. The prices are the consensus prices between Amazon and B&H Photo and Adorama as of November 1 in 2016. These are new condition with USA warranty prices, from authorized dealers. Prices are the body only kit, except for cameras without an official body-only kit – we use the lowest priced standard kit (eg w/18-55). Older cameras that are no longer available in new condition with USA warranty from the above retailers, or are available in a very limited fashion, are not included. We had about half a dozen new DSLRs this year. The price pattern we saw with full frame is repeating here as well, there are some price drops but also some price increases of the very same model. A few more increases than decreases actaully, including the price-leader Sigma SD1 going from $2000 to $2300. The Sony a77 II also had a spike in its price. We even have a strange case where currently the Canon T5i body only is more expensive than the T5i w/18-55 kit (at the same authorized dealers). With Pentax pruning its line-up, and its prices going up, the entry-point prices of the APS-C DSLR market have increased, both Overall (the first chart) and the “Take Pictures With” kits (the second chart). Canon and Nikon are holding steady at their entry-point prices. So for someone looking for a first DSLR, they may be better off looking at the refurbished or used market, considering some of these DSLRs are rather old. Nikon created a bit of a stir by releasing a new “flagship APS-C” camera with the D500, while Canon was more predictable price-wise with the 80D. Pentax’s new entry is the usual value-frontier type of a model with the K-70 being somewhere in the middle. 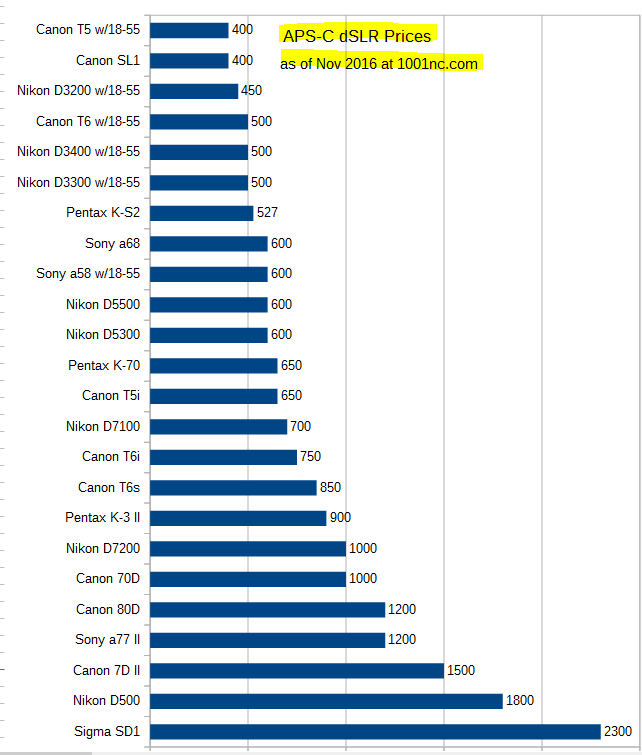 Sony also stayed in the nebulous middle with the a68, while Canon and Nikon refreshed their entry-points with the D3400 and T6. Canon and Nikon have the fullest line-ups, but even with fewer models, Sony and Pentax follow classic DSLR Line-Up patterns. Likewise with Pentax’s options gone, $400 is the lowest “take pictures with” kit, and those two lowest price options are not exactly spring chickens in DSLR-Years. So the same applies as above, one is better off looking at the refurbished and used market.